Citation Information: JCI Insight. 2017;2(17):e91068. https://doi.org/10.1172/jci.insight.91068. Cardiac hypertrophy, as a response to hemodynamic stress, is associated with cardiac dysfunction and death, but whether hypertrophy itself represents a pathological process remains unclear. Hypertrophy is driven by changes in myocardial gene expression that require the MEF2 family of DNA-binding transcription factors, as well as the nuclear lysine acetyltransferase p300. Here we used genetic and small-molecule probes to determine the effects of preventing MEF2 acetylation on cardiac adaptation to stress. 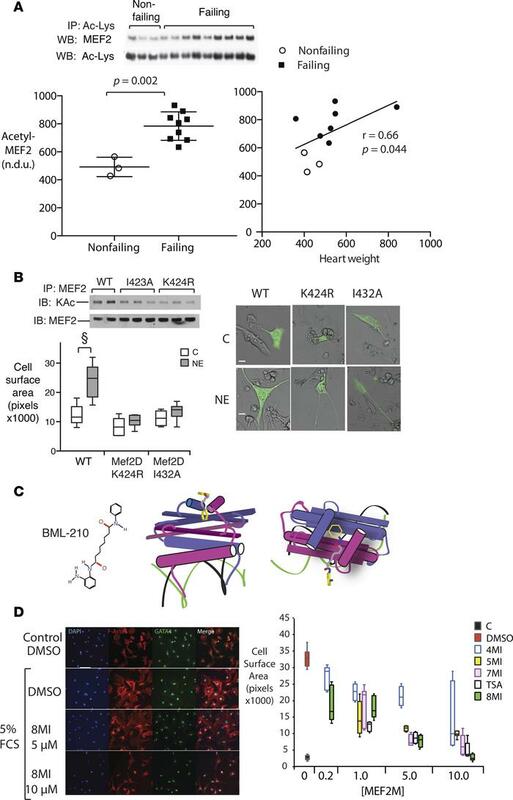 Both nonacetylatable MEF2 mutants and 8MI, a molecule designed to interfere with MEF2-coregulator binding, prevented hypertrophy in cultured cardiac myocytes. 8MI prevented cardiac hypertrophy in 3 distinct stress models, and reversed established hypertrophy in vivo, associated with normalization of myocardial structure and function. The effects of 8MI were reversible, and did not prevent training effects of swimming. Mechanistically, 8MI blocked stress-induced MEF2 acetylation, nuclear export of class II histone deacetylases HDAC4 and -5, and p300 induction, without impeding HDAC4 phosphorylation. Correspondingly, 8MI transformed the transcriptional response to pressure overload, normalizing almost all 232 genes dysregulated by hemodynamic stress. We conclude that MEF2 acetylation is required for development and maintenance of pathological cardiac hypertrophy, and that blocking MEF2 acetylation can permit recovery from hypertrophy without impairing physiologic adaptation. MEF2 acetylation is increased in human heart failure and required for cardiac myocyte hypertrophy in culture. (A) Muscle enhancer factor-2 (MEF2) acetylation in heart failure. Human left ventricular myocardial samples were homogenized and subsequent lysates were immunoprecipitated with an anti–acetyl-lysine (anti–Ac-Lys) antibody as described (see Methods) and immunoblotted with antibodies against total MEF2 and Ac-Lys as a loading control. Above: Representative immunoblots. Below: Acetyl-MEF2 (normalized to Ac-Lys) (n = 14 subjects). Left: Individual nonfailing versus failing values plotted together with mean ± SEM. Exact 2-tailed P value was calculated using Mann-Whitney test. Right: Scatter plot of the same data showing correlation of acetyl-MEF2 with heart weight. Spearman r value and 2-tailed P were generated using Prism v.6 software. n.d.u., normalized densitometry units. (B) Acetylation-defective MEF2 mutants block endogenous MEF2 acetylation and hypertrophy in culture. Neonatal rat ventricular myocytes (NRVMs) expressing EGFP and WT MEF2 or 1 of 2 acetylation-defective MEF2D mutants (I423A or K424R) were cultured in the presence of 4 μM norepinephrine (NE) or its vehicle (C) for 48 hours. Above: Representative immunoblots showing MEF2 lysine acetylation in the presence of the indicated MEF2 expression vectors. Below left: Growth response to NE. Left: Representative merged brightfield and fluorescence images. Scale bars: 20 μm. Below right: Quantification of myocyte surface area. n = 3 independent experiments. Graph displays interquartile range ± SEM. (C) Chemical probe of MEF2-coactivator interface. Left: Chemical structure of parent molecule BML-210. Center and right: 3D structure views of BML-210 interaction with the MEF2-coregulator interface, side and top views, respectively. Green and black wires: DNA helices. Purple and magenta: MEF2 monomers. An interactive 3D version of these figures is provided in Supplemental File 1. (D) MEF2 modulation prevents serum-induced myocyte hypertrophy in culture. NRVMs were exposed to 5% fetal calf serum (FCS) in the presence of a series of BML-210 derivatives at the indicated concentrations (40) or their vehicle (DMSO). Left: Representative images. Scale bar: 50 μm. Right: Myocyte surface area was quantified using NIH ImageJ. Graph summarizes 3 separate experiments and displays interquartile range and SEM.